Woodstock North High School held a homecoming pep rally Friday, September 21, 2012 in Woodstock. Woodstock North will host events throughout next week with the theme "A Night in the City," culminating in a homecoming football game against Dundee-Crown Friday, September 28. Mike Greene - mgreene@shawmedia.com Brittany Zieman (left) and Nicole Blackman cheer with classmates during a homecoming pep rally at Woodstock North High School Friday, September 21, 2012 in Woodstock. Woodstock North will host events throughout next week with the theme "A Night in the City," culminating in a homecoming football game against Dundee-Crown Friday, September 28. 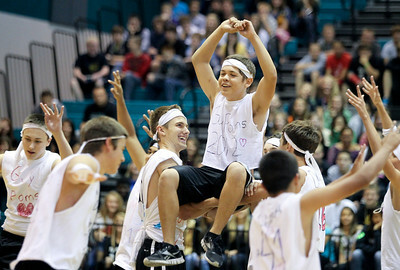 Mike Greene - mgreene@shawmedia.com Nick Hersha is lifted by other members of the guy poms during a performance at a homecoming pep rally at Woodstock North High School Friday, September 21, 2012 in Woodstock. Woodstock North will host events throughout next week with the theme "A Night in the City," culminating in a homecoming football game against Dundee-Crown Friday, September 28. 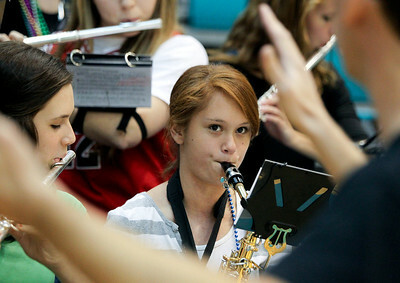 Mike Greene - mgreene@shawmedia.com Hannah Wilkes watches for direction while playing with members of the band during a homecoming pep rally at Woodstock North High School Friday, September 21, 2012 in Woodstock. Woodstock North will host events throughout next week with the theme "A Night in the City," culminating in a homecoming football game against Dundee-Crown Friday, September 28. Mike Greene - mgreene@shawmedia.com Josh Jandron waits before performing with the guy poms during a homecoming pep rally at Woodstock North High School Friday, September 21, 2012 in Woodstock. Woodstock North will host events throughout next week with the theme "A Night in the City," culminating in a homecoming football game against Dundee-Crown Friday, September 28. Mike Greene - mgreene@shawmedia.com Savannah Leone performs with the cheer team during a homecoming pep rally at Woodstock North High School Friday, September 21, 2012 in Woodstock. Woodstock North will host events throughout next week with the theme "A Night in the City," culminating in a homecoming football game against Dundee-Crown Friday, September 28. 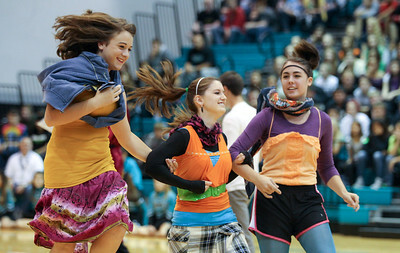 Mike Greene - mgreene@shawmedia.com Annie Bartlett (left), Becky Hapeman, and Rachel Stout display examples of clothing that could be worn for "Crazy Mismatch Day" during a homecoming pep rally at Woodstock North High School Friday, September 21, 2012 in Woodstock. Woodstock North will host events throughout next week with the theme "A Night in the City," culminating in a homecoming football game against Dundee-Crown Friday, September 28. 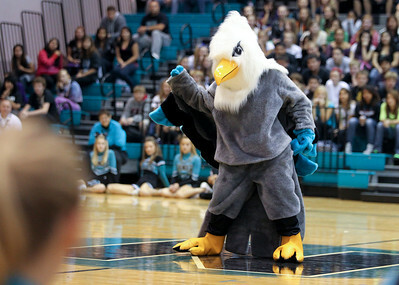 Mike Greene - mgreene@shawmedia.com Woodstock North High School's new mascot 'Thunderbird' performs during a homecoming pep rally Friday, September 21, 2012 in Woodstock. Woodstock North will host events throughout next week with the theme "A Night in the City," culminating in a homecoming football game against Dundee-Crown Friday, September 28. Josh Jandron waits before performing with the guy poms during a homecoming pep rally at Woodstock North High School Friday, September 21, 2012 in Woodstock. Woodstock North will host events throughout next week with the theme "A Night in the City," culminating in a homecoming football game against Dundee-Crown Friday, September 28.